I tried to buy something on line the other day and the website came up with an error message saying "Due to the large amount of spam emails the following are not permitted" and included a list of the most regularly used email addresses. It included Googlemail, Gmail, Yahoo, Orange, Freeserve, AOL, Hotmail, Sky and a few I did not recognise. It went on to say "Please use another email address". Well seeing how my other email addresses were blocked along with my Gmail I decided to spend my money elsewhere. Their loss! Just for fun I went in later and registered with a http://10minutemail.com/10MinuteMail/ and it accepted that. What a way to run a business! I agree, Steve. The trouble is that decisions about this sort of thing are being left to techies who are divorced from the customer service ethic. Spam may be a headache but on the other hand so is getting up to go to work in the morning. If you want to make money, learn to live with it, don't throw away half your customers because sifting through the v1agra ads is too much of a chore. I had a similar issue with the Junksale secondhand radio gear website run by LAM Communications. They wouldn't accept Gmail addresses either. They had a link to the webmaster so I emailed him and he said "No, we don't accept Gmail addresses because of spam. Use an ISP address." "But I don't have an ISP address. However we've now had a conversation, you now know who I am and that I'm not a spammer, so can't you enable my account now?" "No." So I went and used Lynchline. Happens here too. Just part of being on the internet? I have the same problem Julian, to the extent that I check my spam folder before my inbox! 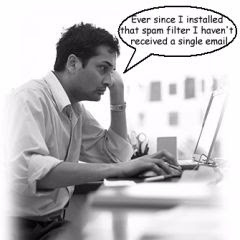 Many companies I deal with now put an addendum on their emails to check my spam folder in case I don't get their email. But if yours was bounced back, sounds like your email did not have a chance, just bounced back from the mail server. Makes it a bit like the "wheel of fortune" game show getting through. No, sorry Norm, this isn't a part of being Internet. It is, as usual, as certain human mankind interprets to being in Internet. As to being at home, at school or elsewhere else, alone or together with others. By itself Internet, as it is inter and net, it's and will be a whole different things from the one that more and more peoples are drawing and will draw on the surface of this world. But we have to work with those. Julian, yours definition of "techies who are divorced from the customer service ethic" it's a great definition really well tailored to small and big firms, "corporations" disease. The worst thing is that working from inside one of this corporate firm I could assure anyone that they are really dangerous for himself and other, like brain diseased ones. But they are making money and "driving the markets", WOW!